Steve and I were in Joshua Tree National Park recently. There wasn’t a super bloom this year, but there were still a few wildflowers. Mostly they were the Sonoran and Mojave desert plants that I wrote about this time last year, and the year before that. And he did, and pulled over, and I jumped out and had a look. 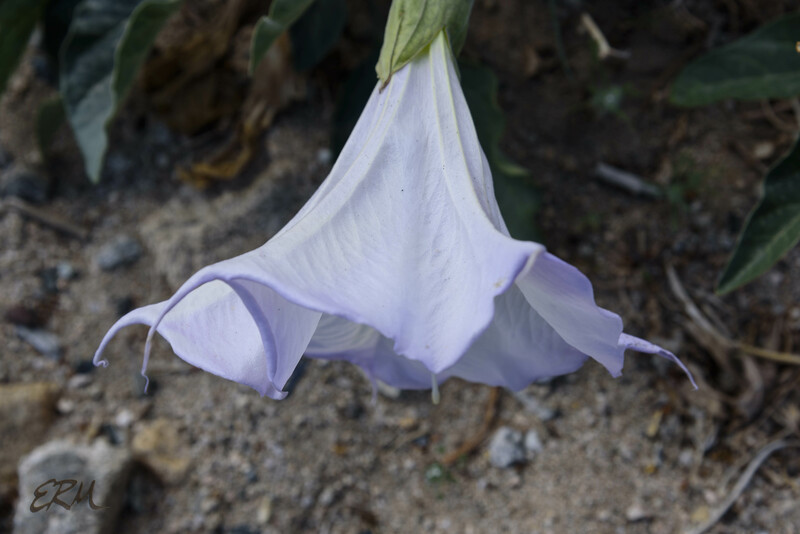 Yes, they were Datura, but all the flowers were spent or closed. So the next day we went back, and drove slowly (whenever no cars were behind) until I spotted some open flowers. And he pulled over again, and had a little catnap in the car while I got on my belly on the sandy roadside shoulder and snapped some pictures. 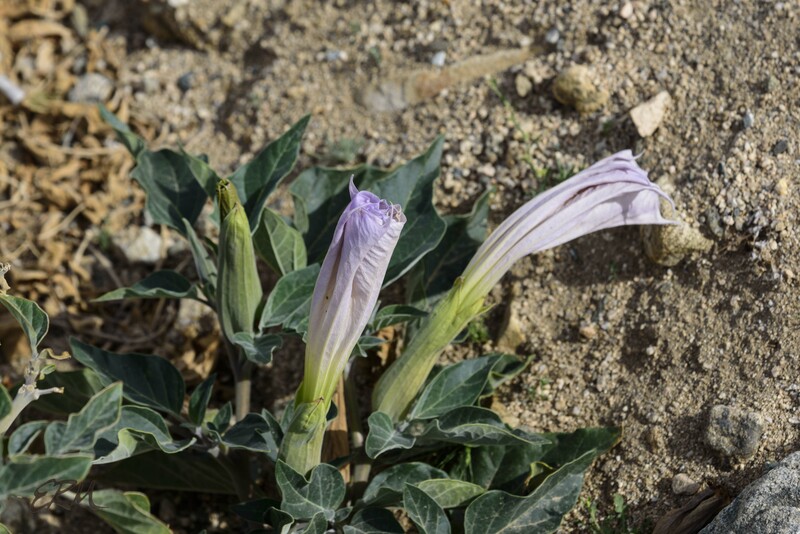 There are two species of datura in JOTR, D. wrightii (sacred thorn-apple) and D. discolor (desert thorn-apple). This one is the former. 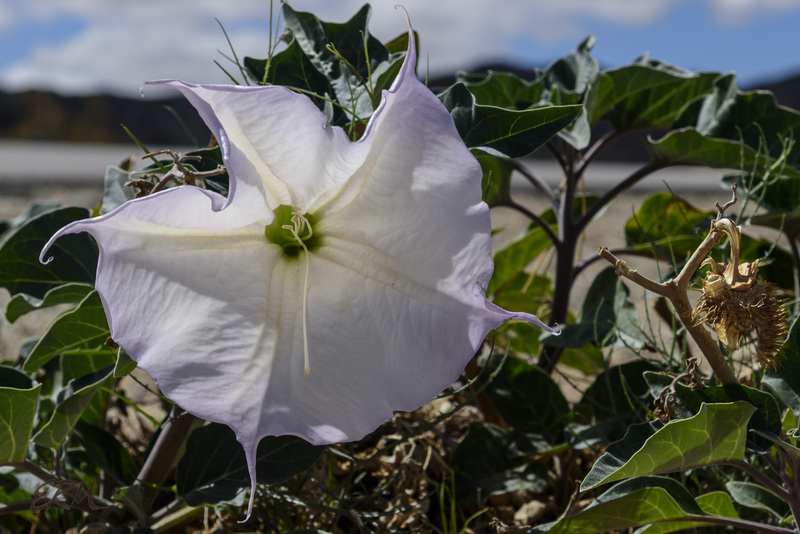 Other common names for the various Datura species include jimsonweed and angel’s trumpet; there are dozens more, including moon lily, moon flower, belladonna, devil’s trumpet, deadly nightshade, thorn apple, mad apple, hairy jimson weed, stink weed, green dragon and locoweed1, and toluaca2. These spectacular flowers measure about 15 cm long, and the plants can grow to a meter or more tall and almost two meters wide. 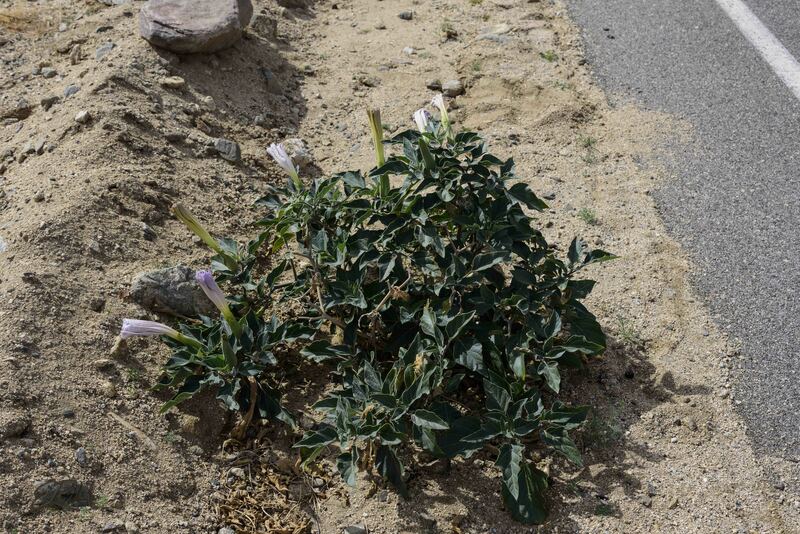 All parts of the plants are poisonous, not unusual for plants in the Solanaceae. 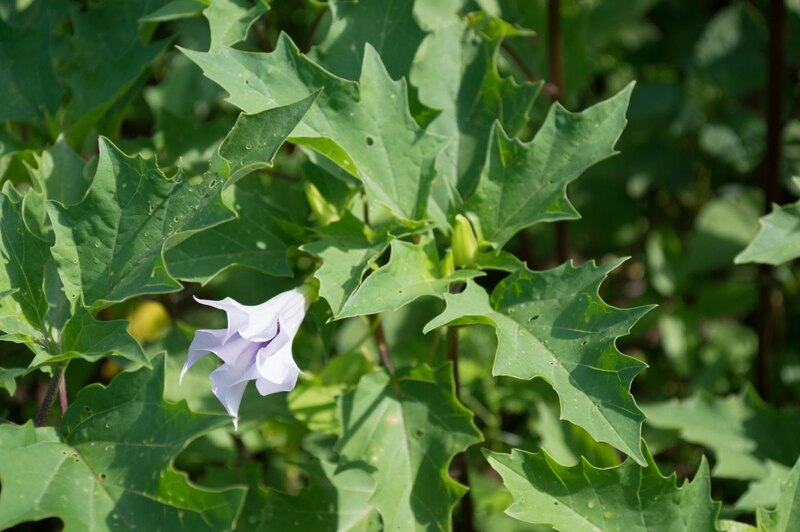 The Solanaceae, like the Apiaceae (see Tasty Umbellifers and Poisonous Umbellifers), is notable for producing both foods (eg, tomato, potato, chili pepper, and eggplant) and poisons (eg, belladonna, tobacco, mandrake, and henbane). 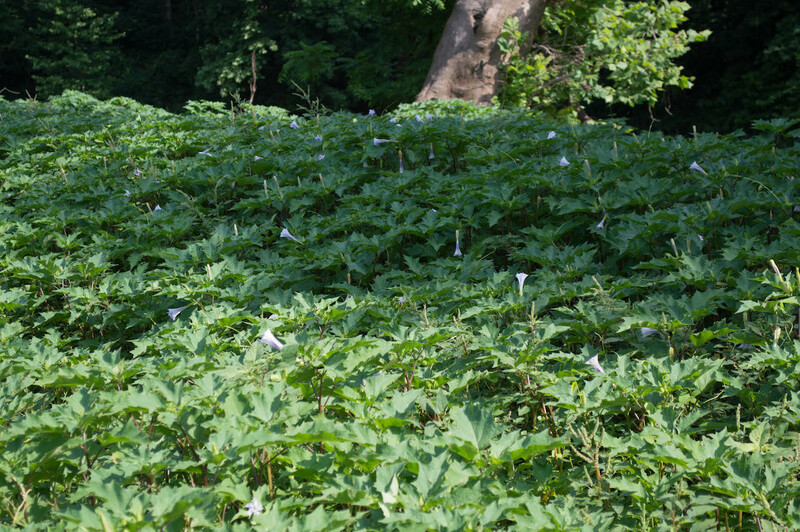 We have a datura here in the Maryland piedmont, D. stramonium [right], but it’s an invasive alien that can form large, nearly monocultural stands. There’s an especially bad infestation on an islet in the Potomac just upstream of the American Legion bridge [below]. 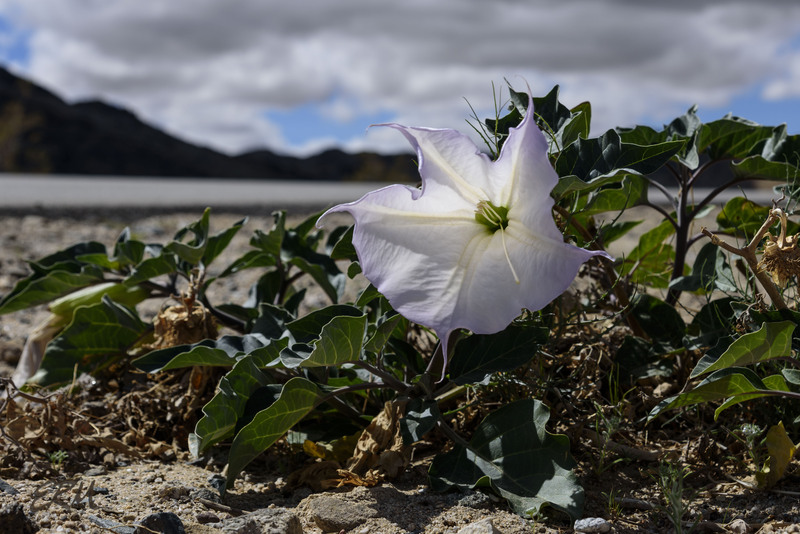 This entry was posted in Uncategorized and tagged Datura, Joshua Tree National Park, Mojave Deseert, Solanaceae, Sonoran Desert by elizabeth. Bookmark the permalink. Those really get around. I see them in places they have no business being, hundreds of miles out of their range. I really do not know what their range is now.